British Eagle Touristique, a Classic or Not? British Eagle are not a celebrated name in the British bike industry. Search on forums for British Eagle bikes and you’ll come across descriptions such as “decent” and “competent” for the models that this brand produced. Yet, if there is a bike that stands out amongst the pages of the British Eagle catalogues over the decades of the 20th century, it is the Touristique. This was a touring bike made to rival and compete with the iconic British-made touring bike of the era, the Dawes Galaxy. In cycling, a lot of a brand’s reputation comes from either the quality of the bikes they produce, or the tradition and pedigree they have in professional racing. If both are combined, well then that’s ideal. You only have to look at marques such as Bianchi, De Rosa and Mercier, to understand the importance of both these factors in garnishing such a reputation, and for fostering an aura of prestige. Nevertheless, the reputation of the Dawes Galaxy, like that of its American counterpart, the Trek 520, was built singularly on the quality of build, the excellence of crafting a great hand-built bike, earning them the distinction of superiority in their field. This superiority distinguishes these bikes today as “classics”. Yet for all that stuff about classics, their high second-hand values and desirability for collectors on Ebay, there are some bikes that are just really damned good, regardless of the decals on the frame. This Touristique, in my view, is a great example of one of them. The Touristique is not be confused with some of the much inferior Coventry Eagle bikes, which were part of the British Eagle brand based in Newtown, Wales. 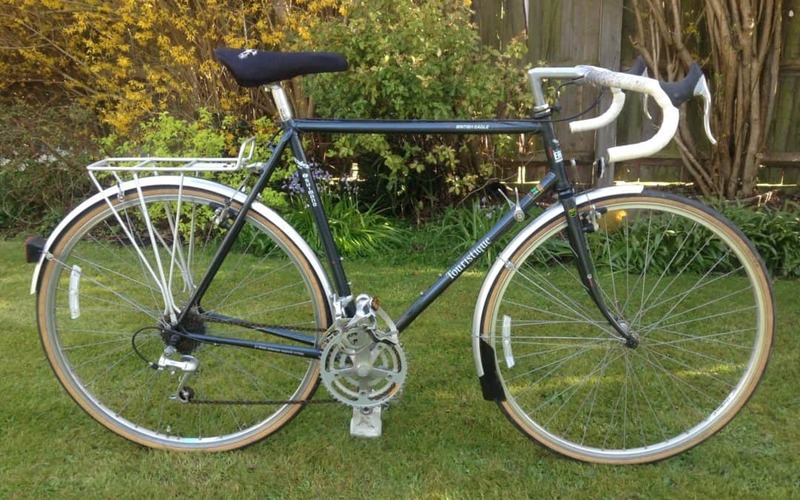 Even back in 1985, the Touristique was not a cheap bike; it sold new for £283, was built with Reynolds 531ST frame and forks, and was undoubtedly the best bike this company produced. It may not have had the reputation of a Galaxy, but it was just as good, perhaps even better. First off, this bike was in fantastic condition for its age. I believe it was built in the late 1980’s, and everything about it had a wow factor. In truth, it would be hard to find one in such unblemished condition if I searched for another. The frame, for example, was scratch free, I mean seriously, hardly a scratch was to be found on the paint; the Shimano RX100 groupset was also in tip top mechanical order, and the components still kept much of their original finish despite the dampness of the British climate. 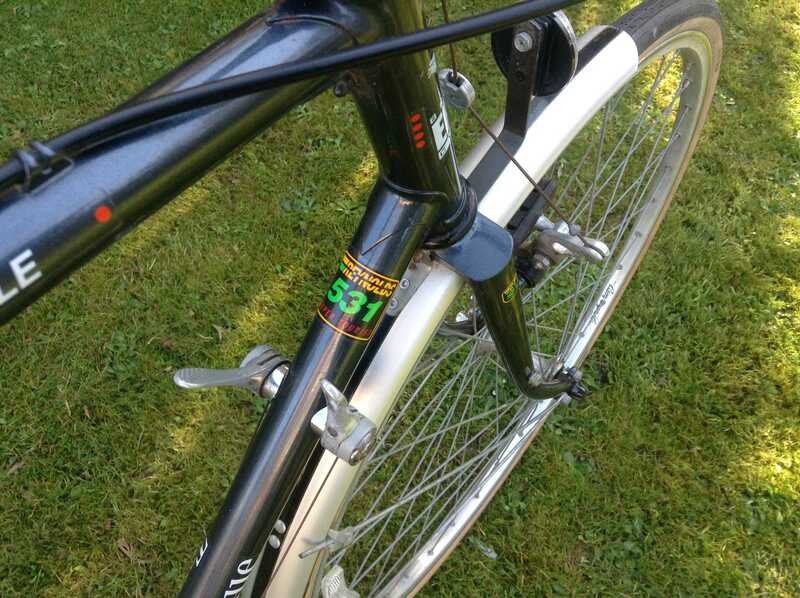 On top of that, the Campagnolo rims, new tyres, clean and shiny mudguards, even the nice handlebar tape, spoke volumes about how this bike had been lightly ridden and carefully treated over the decades. On the road this bike was awesome. Simple as that. It felt strong and sturdy, but also light and responsive, so that you could get really good speed up on the flats and then slip into the granny gears for a smooth transition onto the hills. The RX100 shifting was competent and unfussy, and 21 speeds was certainly well enough gears for tough gradients. It was a quiet and unassuming bike, but very practical with its touring set-up, its 700 x 28 tyres, its confident cantilever brakes. It was the sort of bike that welcomed you to ride all day, to go further, to travel the world. Its relaxed geometry suited me perfectly, being 6’1, with a 32 inch inseam, ( meaning I have a longer torso ), it was one of the most comfortable bikes I have ridden. Little about this bike was worthy of any serious criticism. It was a head-turner, even though it wasn’t flashy; its frame had a certain practicality and modesty in form, with simple lugs and little ornamentation. There’s no chrome nor stamped fork crowns, and even the decals were placed over the paint. The paint itself wasn’t the of high quality of more reputable marques, prone as it was to scratching even when cleaning with fine grade steel wool. Interestingly, the only problematic rust on the bike, which could become an issue in the future, was around the eyelets at the end of the fork blades. The paint had peeled around the holes and bare steel was becoming oxidised there, but with some preventative care it could be cleared up. I sold this bike for…wait for it..£120. Totally undersold. Now I realise that these Touristiques are rather sought after and appreciated by those who know their touring bikes. In this condition, I imagine this bike should have been handed over for at least £250, but there you go. Why did I sell it? Well, it fitted me well, I liked the way it rode, I liked its modest efficiency and all the practicality of the rack, mudguards, the cantilevered brakes and comfortable feel all round. In the end, I suppose what I’d prefer is a lighter touring bike, perhaps more of a fusion between tourer and racer. But that’s just me, and I wish I could ride it again. I don’t believe there was a standard build for Touristiques. Each bike seems to have been built with what was available at the factory at that time, but many of these bikes were built with Shimano parts. I’m not sure why this particular bike had Campagnolo rims, but it was a cool touch to this build. I agree with your assessment of this bike. It might be a little later than 1989 given the RX100 groupset; definitely one of the last grey ones which were produced up to 1993 I think, although I’ve never seen reference to a grey one after 1992. A small batch of metallic red ones with the RX100 groupset were sold as part of the 1995 brochure and that marked the end of the Touristique I believe. I have one of the red ones and I get the feeling that it was part of a production run to use up the last of their 531 tubes sets or spare pre-built frames. Lovely bike though and I won’t be parting with it. Thanks for visiting , John, and for your insights. I imagine a red Touristique must be a good looking bike, and I understand why you won’t be parting with it. This one was one of the best touring bikes I’ve ridden. Cheers, Dominic. I managed to come upon a sorry excuse for a bike recently. It was a complete mosh mash of components, straight bars. Even the wheels were odd. Normally not worth a second glance, the Reynolds 531ST sticker caught my eye. The Touristique frame that was hiding underneath the grime is lovely, but unfortunately has more chips than the local friary! Not for the purists, but I decided to use it the heart of a gravel bike build. The frame has been fully stripped, sanded and primed and is now waiting for a top coat in a very similar colour to the original grey/blue. Components are what I have spare but include a Campagnolo double chainset, Cinelli Record stem & bars, Rolls saddle, Deore XT rear mech, Dura Ace 7400 8 speed downtube shifters and Shimano 600 brake levers. The cantilevers are Avid shorty 6 and shorty 4 and the wheels are Mavic MA3s on Quando hubs that are silky smooth. I cannot wait. It’s just a shame you cannot get replacement Touristique decals of this type anywhere! Hi Chris, thanks for the comment. I’d love to see a photo of your completed bike, it sounds like you’ve given it a new lease of life. I take it that the original owner swapped out most of its parts, making it a custom build but not really taking much care of it. Shame about the Touristique decals, someone needs to create new copies of them..
23″ 1987 British Eagle Touristique, looks nice and as the ad says “Bargain of the Year. (so it would seem ! )” going for £50. That bike might be a nice replacement? It’s not mine, just saw the ad and having read your article thought I would pass on the link. Wow, someone got a great deal. Thanks for sending the link, I don’t imagine there’ll be another at that price for a good while..
Good luck, it’s well worth investing in one if it can be restored..